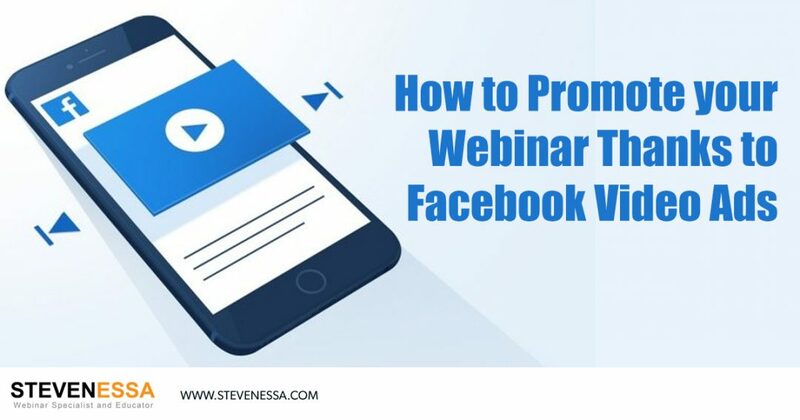 Combining the power of Facebook advertising with the power of video marketing is a sure-fire way of getting more registrants to your webinar. First, because 36% of online consumers trust video ads according to Nielsen Wire and 46% of video viewers take some sort of action after viewing a video ad according to the Online Publishers Association. The first step is choosing your target market. In other words, who your customer avatar will be for your video so you can address them directly. This will not only shape the content of your video but also the targeting you choose when launching the Facebook video ad. Since you won’t address real estate investors the same way you would address home owners for example, it is very important you get clear about who exactly you want to target through your video ad. The second step is writing the script of your Facebook video ad. The first few seconds are key, as it’s right at the beginning that viewers will decide whether they are going to continue watching or not. Plus, because Facebook video ads are muted until the viewer decides to watch the video and turn the volume up, the first few seconds should be visually attention grabbing. This is why you’ll often see a big “stop” sign appear in the first few seconds which is quite effective to capture people’s attention, or you’ll see a presenter waving their arms, and text saying “turn the volume up”. Your script also needs to persuade your audience to follow your call to action. In order to do so, include proof, educate your audience to show you’re an expert on the topic, or even demonstrate your product. To persuade viewers even further, remember to underline their pain points and state you have a solution. For example, your audience’s main pain point could be wanting to add value to a property to sell it at a higher price but not having the budget for making the improvements they’d like to make. Lastly, end your video script with a strong call-to-action. Since some viewers won’t necessarily watch your video until the end, it’s important to mention the call-to-action a few times throughout the video, and then end the video with a clear, strong call-to-action, stating “to access this exclusive training, click on the sign up tab below this video now”. The third step is producing the video. Once your script has been written, decide whether you want to read the script direct-to-camera or whether you’ll just use a voice over and visuals. If you decide to read the script direct-to-camera, you’ll need a camera, a tripod to keep the camera steady, lights or natural lighting, a microphone and a teleprompter if your script is too long to memorize. If you decide to use a voice over and visuals, you’ll only need a microphone and footage or images. To edit the video, we recommend using “Camtasia” if you are using a Windows computer or “Screenflow” if you are a Mac computer user. Alternatively, you can outsource the editing and post production tasks by using people from websites such as upwork.com. Your video should be a MOV, MP4 or GIF file, and the maximum file size should be 2.3GB. Should you want your Facebook video ad to also be displayed on Instagram, make sure your video doesn’t exceed 60 seconds. Once your video is ready, you’re ready to set up your Facebook video ad. Simply login to your Facebook account, and click on the drop down menu, at the top right hand side. Then, click on “create ads”. You will then be asked to choose what your marketing objective is, from a list of various different options. We recommend you choose “traffic” or “video views”. The text you write for your ad also plays a major role. When writing advertising copy, write as if you were talking to one person. In addition, underline the benefits for people to click on the call-to-action. For example, you could say “Discover the secrets and techniques used by the most successful real estate investors to turn a tired-looking property into one people are ready to pay much more for”. By following the steps outlined above, you’ll be able to dramatically increase the registration rate of your webinar by leveraging two of the most effective marketing strategies, Facebook advertising and video marketing.